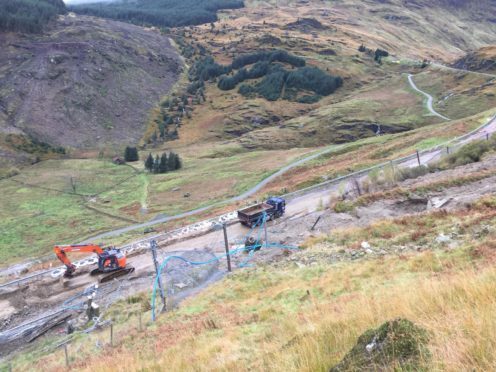 Debris-fences, catch-pits and newly-installed bunds at the side of the road have been monitored and emptied in the past month by engineers working on behalf of Bear Scotland after prolonged heavy rain in the area over the course of the past 10 days. Eddie Ross, Bear Scotland’s North West representative, said: “Heavy rain in Argyll is continuing to have an impact on the Rest and Be Thankful with an estimated 900 tonnes of material reaching the mitigation measures next to the road over the past four weeks. Bear Scotland teams remain on site at the Rest and Be Thankful to empty the mitigation measures of the debris, reinstate the debris-fences to their full capacity and reinforce some of the bunds which have been constructed next to the roadside, along with soil nailing and netting to stabilise the slope below the A83. Temporary traffic lights have been put in place to protect the workforce with traffic being held for short periods to allow for work to be carried out. In October a series of landslides seen the route closed for nine days after 3,000 tonnes of debris came down the hillside after heavy rain. Argyll and Bute Council leader Aileen Morton said: “While the mitigation measures at the Rest and Be Thankful are having an effect, and we are grateful to the BEAR Scotland team who are working in all weathers in very difficult conditions, the events in early October made it clear that a permanent solution also requires to be progressed. “With the A83 Taskforce due to meet on Thursday I expect that the Cabinet Secretary and officials from Transport Scotland will receive a very strong message from local residents and business owners that more needs to be done. Transport Secretary Michael Matheson recognised the importance of the route and earlier this year confirmed £66 million had been spent on the A83 since 2007, including £9.6 million towards landslide mitigation works and the local diversion route.